A variable temperature control within the range from 65ºC to 230ºC will let you get a perfect cooking result with every dish. 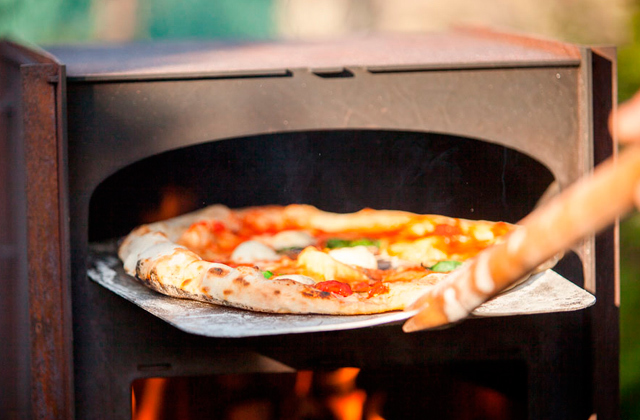 Your foods will be ideally cooked from the inside and feature an appetizing golden crust. It will take you some time to get the hang of all cooking modes. With this crock pot model, you will get two helpful and practical kitchen appliances in a single unit. Offering all traditional features of a top-quality slow cooker, the device also doubles as a multi-cooker. 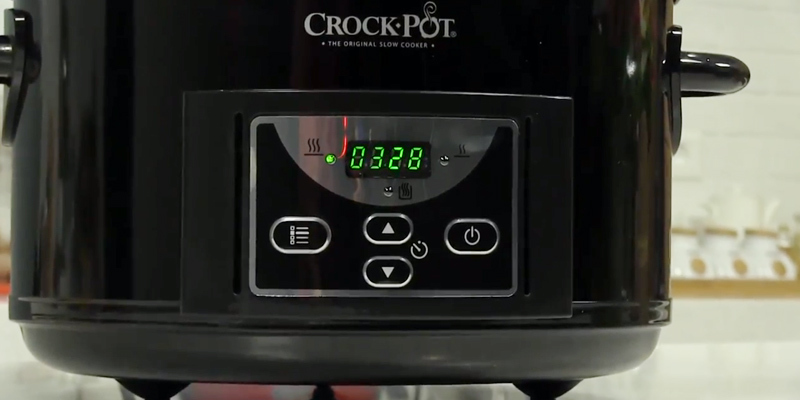 Fitted with 5 pre-programmed cooking modes, the crock pot delivers the functions of an oven, deep fryer, and steamer. A built-in timer allows adjusting the cooking time up to20 hours giving you an opportunity to experiment with ingredients and adapt a variety of your favourite meat or vegetable dishes and dessert to slow cooking. Carrying handles are pretty small and might seem inconvenient. Today, slow cooking is a popular cooking technique among both home cooks and professional chefs. And that's for a good reason. Your foods come out juicy, deliciously tender, and retain all the nutrients and vitamins. The SCCPRC507B-060 crock pot offers an easy way to create flavoursome and healthy meals at home without a hassle of time-consuming cooking. The set comes complete with 3 helpful utensils including a serving spoon, slotted spoon, and a skimming/straining spoon. Made of durable materials, they are safe to use with a stoneware bowl. A red LED indicator is poorly visible in the red body. Thanks to its lower pot capacity of 3.5 litres, this model will become a real find for small families of 3 or 4. Meanwhile, it is pretty compact and will perfectly find its place on your countertop without taking much storage space in your kitchen. It will make an affordable and efficient addition to your kitchen arsenal. An aluminium bowl boasts a unique DuraCeramic™ coating that efficiently prevents food scorching or sticking and even allows cooking without using oil. Hinged lid removal and fixation will require some practice. 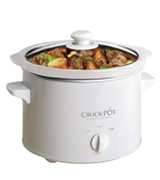 The DuraCeramic crock pot is distinguished by a specific design featuring a hinged glass lid. This little handy option will let you serve you freshly cooked dish piping hot right in a crock pot. Besides, the bowl suitable for use on all cooker types, will provide a variety of cooking options and even allow storing ready-made meals in the fridge. A powerful heating element will heat up the bowl quickly and evenly allowing you to have your meal cooked within a maximum short period of time and preventing the foods from sticking to the bowl bottom. There is no keep-warm feature. 2.4 litres is an optimal bowl capacity for single-pot meals and casseroles. Fairly simple controls and unit operation require no specific skills. Just load the ingredients, choose one of two temperature settings and let the cooker do its magic while you are at work or running errands. It will become an ideal kitchen assistant for a couple and those who live alone. When choosing home appliances, more and more often we seek multi-functionality. Not only does it help us to optimize kitchen space and cooking process but also it allows saving money and, what’s not less important, precious time and effort on buying several devices. 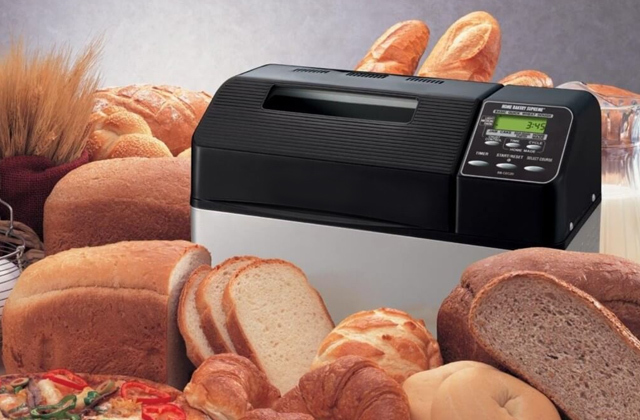 Moreover, in their endeavours to satisfy the needs and demands of modern lifestyle, manufacturers usually equip their all-purpose appliances only with really helpful functions omitting some minor and less necessary options. Similarly, always striving for innovations to keep up with all current tendencies and provide its customers with the most efficient cooking solutions, Crock Pot has created one of its most advanced slow cookers with unmatched functionality ensuring a whole variety of cooking methods. The CSC024 is a digital slow cooker that offers all basic features you’d expect from a top-quality crock pot. 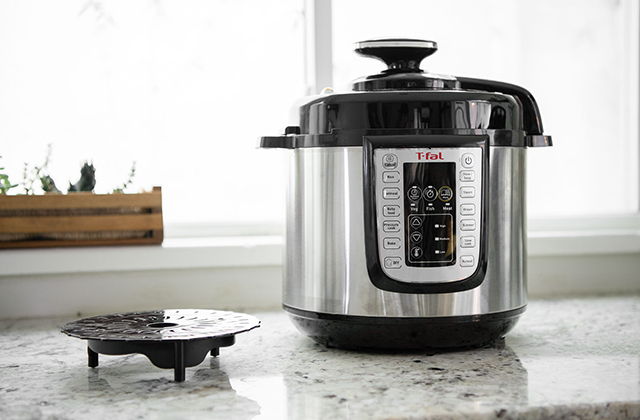 Fitted with heating elements installed all around the pot for consistent even cooking, the unit has two basic temperature settings and an automated Keep-warm function like any other traditional crock pot. 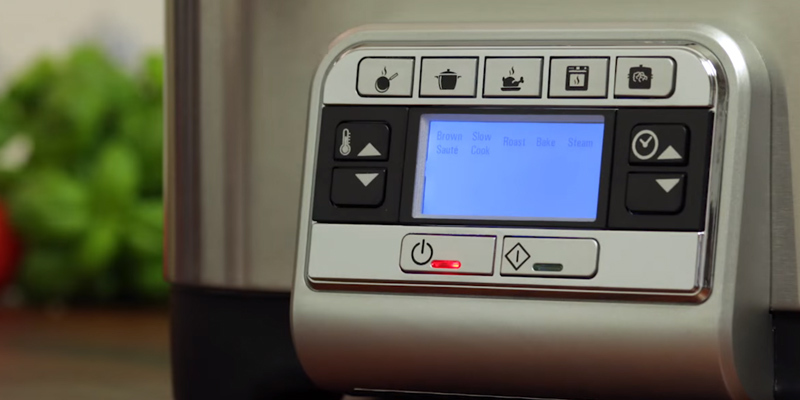 For quick and convenient cooker control, there is a digital display. Cool-touch handles contribute to safety and ease of unit handling while a glass lid will keep the heat inside during cooking and keep your dish warm for longer when serving right in a bowl. Yet, what makes this model different from other crock pots is an aluminium bowl. Thanks to a premium non-stick coating, it features all the qualities of a traditionally ceramic crock pot bowl. However, unlike ceramic bowls, the aluminium one allowed going far beyond the slow cooking method and pack the appliance with 4 more pre-programmed cooking modes including roasting, steaming, sauteing, and baking. 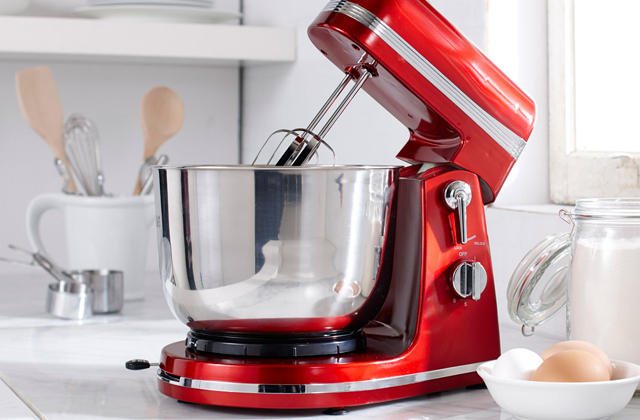 Besides, variable temperature and time controls will let you customize the cooking process to any recipe at hand. All of this turns the Crock Pot slow cooker into a fully functional multi-cooker. If you need a truly efficient and helpful all-purpose kitchen appliance that will cater to all your cooking needs, the Crock Pot digital slow cooker is the right option to go for. 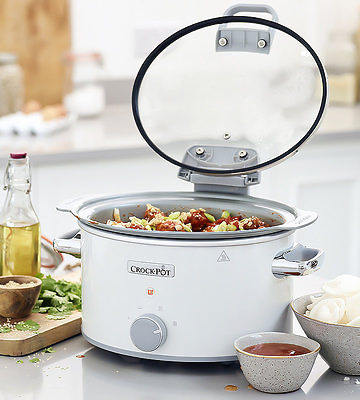 With a variety of cooking modes available in the Crock Pot Multi-cooker, you’ll be able to cook literally anything you want, whether be it soups, stews, sautes, and stir-fries or succulent and deliciously tender joints of meat and mouth-melting puddings and desserts. Packed with a roast rack and a measuring cup, the crock pot also allows you to make scrumptious roasts with a crispy golden crust and flavourful Spanish paellas, spicy Thai rice dishes, and delicate creamy Italian risottos. This model makes a decent alternative to an oven, steamer, and even a deep fryer. 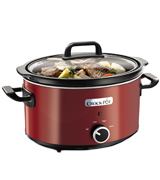 With the Crock Pot Multi-cooker, all your meals will always be cooked to perfection. In a fast pace of modern life, one of the most valuable resources almost everybody lacks is time. Hence, trying to manage everything, many people plan every day ahead. Not only careful scheduling will help you cope with all chores you have on the list it will also let you find time for leisure and entertainments with family. Cooking is one of the essential daily chores you can’t avoid especially if you and your family stick to a healthy diet based on freshly cooked meals 3 times per day. But even apart from healthy eating philosophy, you’ll hardly be able to eat in a restaurant or cafe several times daily. Yet, as busy as we usually are, most of us are not eager to spend hours in the kitchen every evening cooking dinner and preparing breakfast in advance. Think you are in a bind? Not at all! 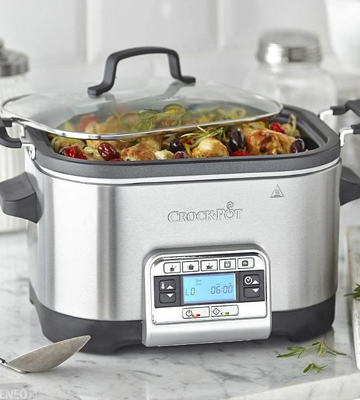 With the programmable crock pot slow cooker, you’ll be able to create healthy and nutritious dishes without much of your time and effort required and plan your daily meals your way. 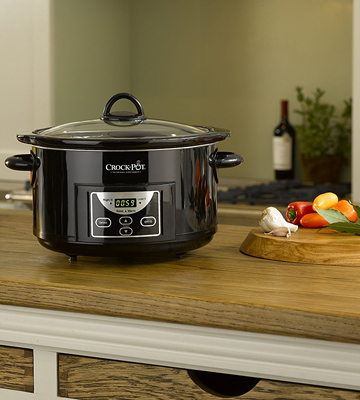 Unlike many other slow cookers and crock pots featuring only high and low modes with pre-programmed time settings, this model boasts a digital countdown timer allowing you to set any cooking time up to 20 hours. Simply load all ingredients into a ceramic bowl, select high or low heat settings, choose the cooking time, and go. No need to watch the cooking process or stir foods, you can get on with your day and the crock pot will do all the cooking job for you. 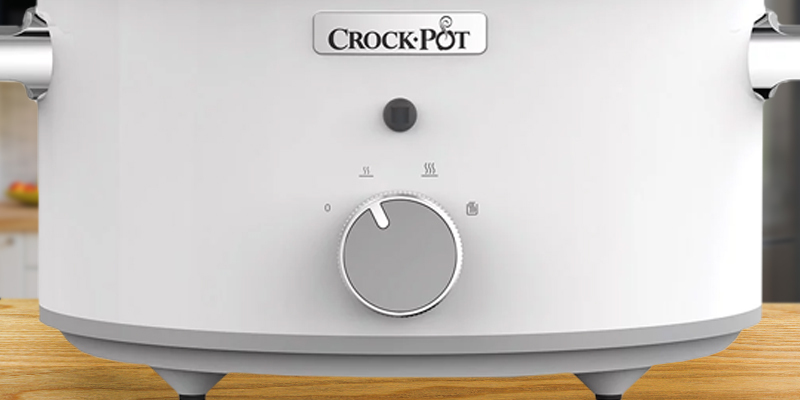 Once the selected cooking time is finished, the crock pot will automatically shift to warm and maintain the food temperature until you are ready for a meal. The only tiny drawback some customers claim is that the digital timer features no delayed start option. However, there is a reason for that since it’s not safe to leave food, especially raw meat, sitting in a pot at a room temperature for several hours. Speaking of the unit capacity, the 4.7 L bowl is enough to feed up to 6 people. 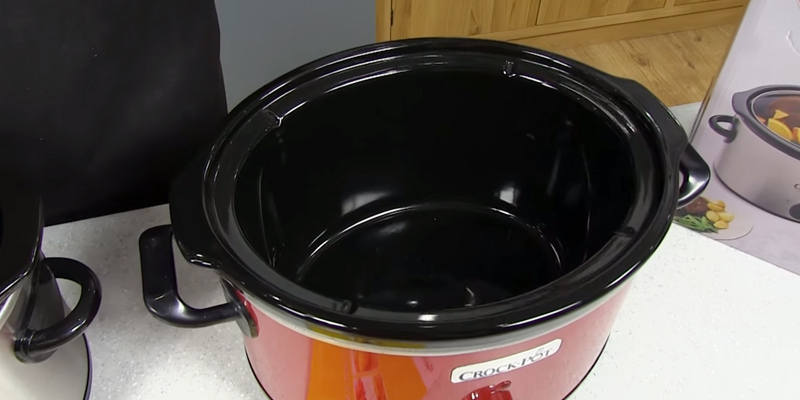 So, whether you need to cook a delicious meal for your family or make a bow full of chilli, curry, or mouth-watering honey glazed chicken wings for a garden party or a potluck, this crock pot with timer will come to help. After cooking, you can easily wash the bowl in a dishwasher or simply clean it with a soapy warm water. With a timer option, you can easily make up your daily plan rest assured that your freshly cooked hot dinner will be waiting for you at home when you need it. This Crock Pot model will give you an amazing opportunity to cook not only simple fresh meals but also exquisite creative dishes worth a restaurant menu. Thanks to a flexible and precise time selection, you can adapt regular recipes for a slow cooker and will have a lot more freedom for culinary experiments to create unusual signature dishes that will quickly become your family favourites. One of the biggest benefits of slow cooking is the incredible food flavouring you can achieve. Being simmered in their own juices for hours, ingredients produce distinctive, deep, and rich flavours you’ll never get when baking, frying, or grilling. Slow cooking perfectly releases the whole bouquet of spices, individual tastes, smells, and flavours. The cumin, cayenne, basil, garam masala, ginger, garlic, turmeric, garlic, and cinnamon will infuse your dishes with unforgettable aromas. Besides, the crock pot will tenderize even inexpensive meat chops and turn them into tantalizing mouth-melting delicacies. Whether you are a first-time cook or a creative culinary enthusiast, this programmable crock pot will help you realize all your culinary ideas. All busy moms look for a quick and easy way to cook substantial, nutritious, and healthy meals for the whole family. Whether it comes to homemakers or those who spend days at work, no one wants to waste the evening in the kitchen watching a meal bubbling on the stove instead of enjoying time with a spouse and kids. Hence, striving to slash their kitchen time to the maximum, many people start packing their kitchens with a whole variety of appliances. But often they end up with many useless tools and a drastic lack of storage space in the kitchen while the problem of time-consuming and messy cooking still remains unresolved. If you find yourself in a similar situation, our recommendation is to set your eyes on the SCV400RD-060 crock pot slow cooker. 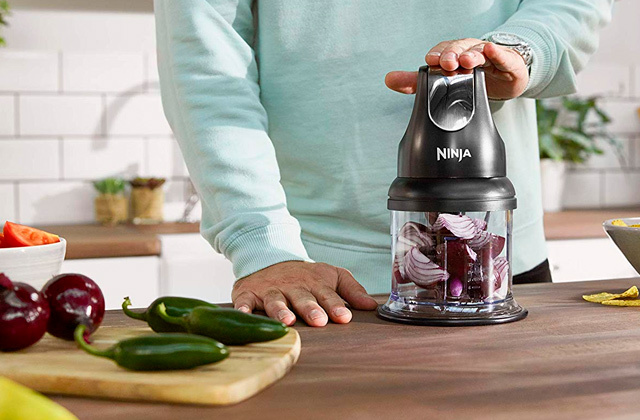 Designed with the ease of use and your daily cooking needs in mind, this handy appliance will take the hassle off out of the cooking process without taking much space on your countertop. See for yourself. The first thing you will like about this model is its elegant and compact design. A sleek body in a beautiful wine-red colour with neat black handles and a glass lid on the top reminds an ordinary pan and will blend with any design while a pretty small unit size will make it a perfect fit even for confined kitchens. Yet, despite its compactness, the crock pot accommodates a 3.5 L bowl allowing you to cook enough food for 3 or 4 people. The bowl is made of high-quality ceramic evenly distributing heat and preventing sticking and scorching. Covered with a lid, it can also double as a serving pan and will keep your meal warm for some time after removing it from the heating base. Thanks to fairly simple controls, you will easily handle the cooker operation even if you’ve never used crock pots or slow cookers before. A single control knob will let you choose between three heat settings. 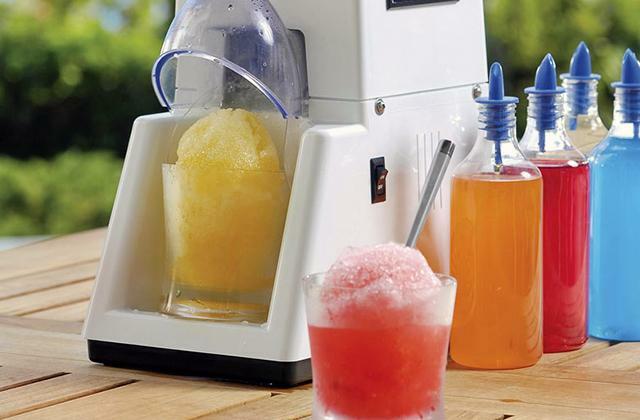 The high setting works great for sauces, soups, snacks and a range of desserts. The low setting will come in handy when you need to leave your unit cooking for the whole day. It’s ideal for stews, curries, and delicately tender meats. Meanwhile, the keep-warm setting will maintain your meal at perfectly hot temperature until you serve it. Without a doubt, this ceramic crock pot will add to your kitchen arsenal and make your cooking routine less time-taking and more enjoyable. To help you out with serving foods cooked in your crock pot, this model comes complemented with a set of helpful utensils including a skimming spoon, slotted spoon, and a serving spoon. A shallow skimming or straining spoon with numerous holes is meant to remove excess fluid, fat, or particles from the food surface while a slotted spoon is used to take out foods from the liquid they were cooked in, be it a broth, sauce, or natural juices released from ingredients. Meanwhile, a serving spoon will come in handy if you want to serve your dish right in a ceramic bowl. When we choose cookware we are going to use on a regular basis, most often, we give preference to the items that can be used for cooking different dishes and applying various cooking methods since, hardly, anyone would like to have a bunch of pans, skillets, and griddles intended only for a single purpose. The same principle is followed when it comes to kitchen appliances. Those that offer more cooking options and opportunities definitely look more attractive for us, especially today, when almost everyone strives to spend minimum time in the kitchen. The CSC038 crock pot is exactly that kind of tool. 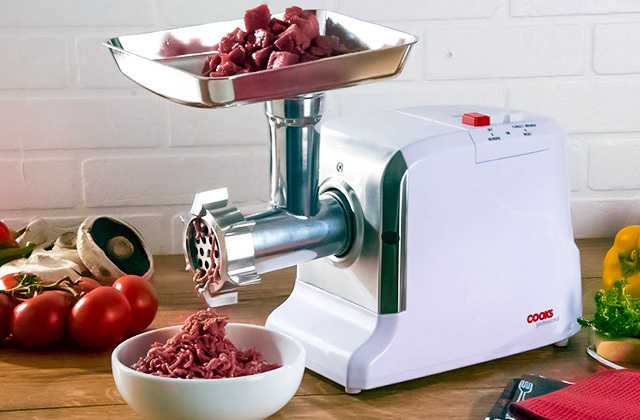 Featuring pretty simple design, this model will provide every versatility you need in the kitchen. At a glance, the unit looks like any traditional crockpot with a cooking bowl inside a heating base and a glass lid on the top. A single control knob allows selecting between 3 basic heat settings including high, low, and keep-warm options. Nothing special, you would think. Yet, beneficial functions that set this crock apart from other models are ensured by small details that might seem insignificant. Thus, instead of a ceramic bowl traditionally found in most crock pots, this unit features a 4.5 L aluminium pot with a unique DuraCeramic coating combining exceptional thermal conductivity of aluminium with non-stick qualities of ceramics. Such smart combo of materials makes the bowl suitable for all types of stoves as well as induction hobs and ovens. Hence, you can pre-brown your meat before roasting it in a slow cooker or put your ready-made stew on a stove to evaporate excess liquid. It’s also worth adding that DuraCeramic coating is highly durable, scratch-resistant and extremely easy to clean. Several more handy features every home cook will appreciate, include a sleek white body with convenient cool-touch handles, small non-skid feet and a securely fitting glass lid. All of this will let you serve your dish hot right in the crock pot. Besides, the lid is hinged that adds convenience when serving food from the crockpot or taking the bowl to the table. 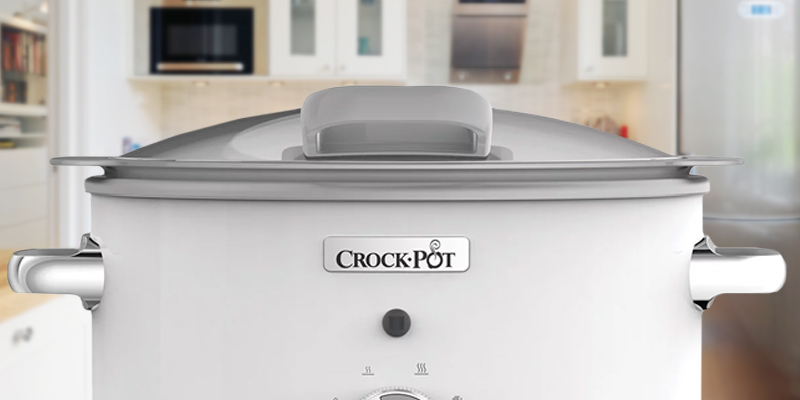 A no-frills design paired with well-thought little details makes this crock pot an efficient cooking solution for any home cook and a perfect match for any kitchen. With healthy eating becoming a modern trend today, more and more people are striving to reduce sugar and refined hydrocarbons intake replacing processed foods, frozen and pre-packaged meals, fast food, and sugary and fatty snacks by healthier home-cooked dishes. Yet, when cooking fresh fruit, vegs, meat, and fish for your dishes, you want to keep maximum nutrients and vitamins in your food while using minimum fats and oil. In this sense, slow cooking is one of the best cooking techniques to be applied, and a DuraCeramic bowl of the CSC038 will be of great help for all healthy diet followers. 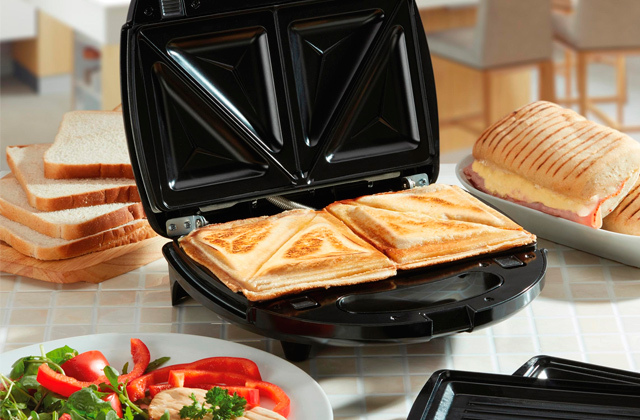 Efficiently preventing ingredients sticking and scorching, the coating allows cooking virtually without oil. As a result, you will get a substantial healthy meal with maximum nutrients and minimum fats. Featuring a number of indisputable benefits, today, a crock pot is almost a must-have kitchen appliance you can find in any household. However, while 6 L models are perfect for large families, they will appear really oversize for couples and those who live alone as well as for the occasions when you need a smaller portion of food or you'd like to cook some kind of side dish. Some people would say you can just use fewer ingredients for your bigger bowl. Yet, if you want to obtain consistently good cooking results, you can’t since following the manufacturer instructions, the bowl should be at least ⅔ full to prevent the food overcooking and drying out. This is where the SCCPQK5025B-050 small crock pot will come in handy. A deep ceramic bowl with a 2.4 L capacity is an optimal size for 2 persons. It is ideal for stews, roasts, sautes, dips, garnishes, desserts, and any one-pot dishes. Simply load the ingredients, choose High or Low heat setting depending on the recipe at hand and forget it until your dish is ready. Though there is no Keep-warm option, a stoneware pot and perfectly insulated heating base will keep your meal warm for a while. Besides, the bowl is oven safe, hence, you can quickly reheat your food in the oven if it cools by the time you come home. Along with cooking single- or dual-portion meals, this crock pot will be of great help as an extra cooker for some special occasions, be it a party, festive family dinner, or any other larger gathering. 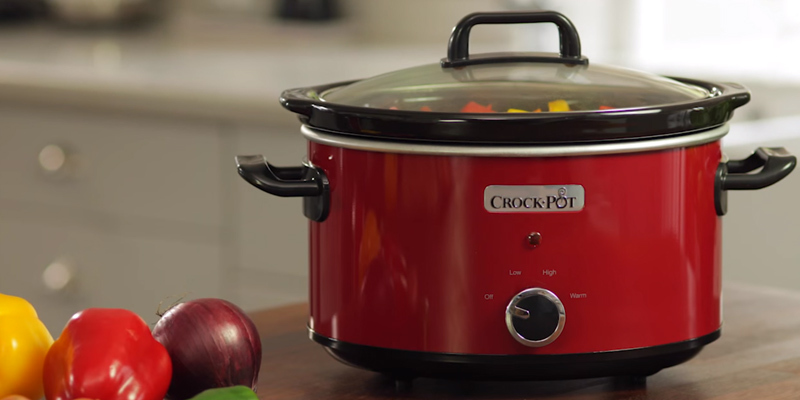 The crock pot will help you cook some entrees, appetizers, bite-sized snacks, and garnishes while you use your conventional oven for baking or bigger roasts. As functional as it is, this model is distinguished by a simple compact design and ease of maintenance. Thanks to its pretty small size, the unit will fit into the smallest worktop spaces. 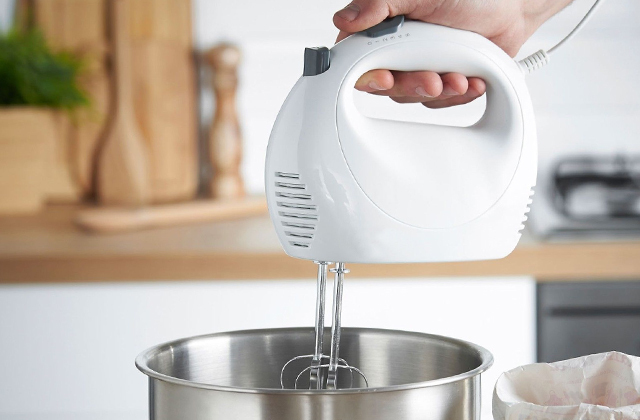 Two side cool-touch handles will let you safely move and carry the unit while a glass lid with a handle will prevent spills when carrying and securely seal the heat inside during cooking. 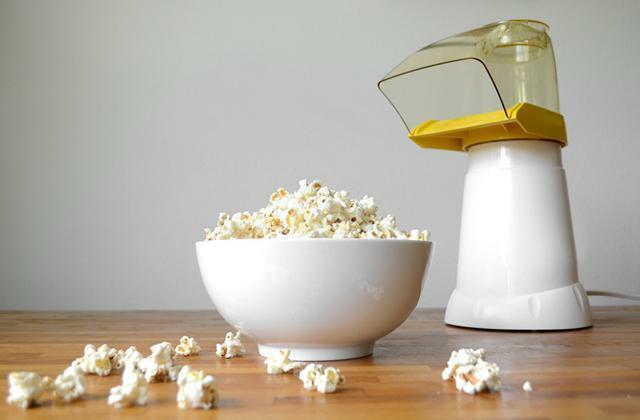 The bowl and the lid are both dishwasher safe for quick and hassle-free cleaning. 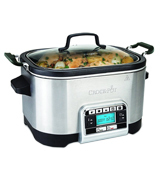 If you need a compact yet fully functional slow-cooker for a smaller family or a smaller household or a lower-capacity unit to complement your larger crock pot, the SCCPQK5025B-050 is a good choice. The first Crock-Pot slow cooker was introduced over 40 years ago as a simple bean cooker. In the 1970s, it was the trademark of Rival Manufacturing Company. Yet, over years, the manufacturer redesigned this simple cooker into a much more functional and versatile unit that quickly gained worldwide popularity. 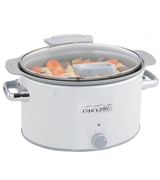 Crock pots offered a completely new and definitely quicker and more efficient way of cooking meals that allowed significantly cutting the time people spend in the kitchens and greatly optimizing their daily schedules. Nothing has changed since then. Using the same slow-cooking technology, modern crock pots still remains one of the best kitchen assistants for numerous families all over the world. Retaining its leading position, Crock Pot keeps up with the pace and continuously introduces innovations to meet modern lifestyle demands. Today, the company produces the whole range of slow cookers from simple manual units to fully programmable and even automatic-stirring models to fit any household needs and any budget. Meanwhile, despite a variety of other brands selling crockpot style devices, the Crock Pot brand name can’t be used by other manufacturers. A crock pot is a really useful countertop kitchen appliance created to cook foods at low temperatures for long periods of time. This electric unit cooks at much lower temperatures than those applied for baking, frying, and boiling and eventually consumes less energy that makes it a pretty economical device. The main idea behind such a slow cooking method is to give you an opportunity to cook tasty and nutritious dishes without a hassle of cooking. 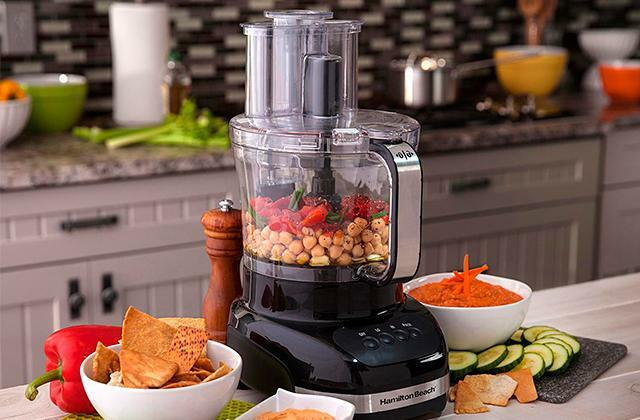 All you will need to do is load fresh ingredients for your meal and let the appliance do the rest. No need to stir ingredients or supervise the whole cooking process. You can set the crock pot in the morning and enjoy your fully cooked meal in the evening. Besides, all natural juices are sealed inside and such ingredients and fibrous vegetables and meat come out deliciously tender. Crock pots are suitable for cooking literally anything, from a variety of stews and soups to porridges, dips, and even exquisite delicate desserts. Many people regard a crock pot as a second name of a slow cooker. Yet, not all slow cookers are crock pots. Initially, the Crock-Pot is a brand name. Though today it is used rather as a generic name referring to any slow cooker, there are distinctive differences between these two seemingly similar appliances. Thus, the crock pot is a container with heating elements along the sides and on the bottom and a ceramic or porcelain pot fitting snugly inside. Meanwhile, a slow cooker features a metal pot that will rest on the base with a heating element which means that the heat is concentrated in the bottom and can cause scorching. The recommendation for slow cookers is to cut ingredients into small pieces to accelerate the heating process while crock pots are suitable for cooking larger chunks and ensure more even heating from all sides. If you are into a healthy diet yet lack time for cooking and need your meals to be ready within the shortest possible time, consider buying one of the modern pressure cookers. 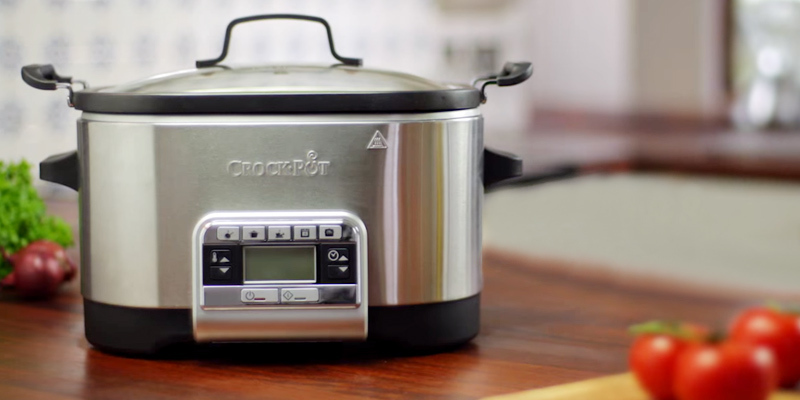 Modern crock pots fall into two types: programmable and mechanic models. 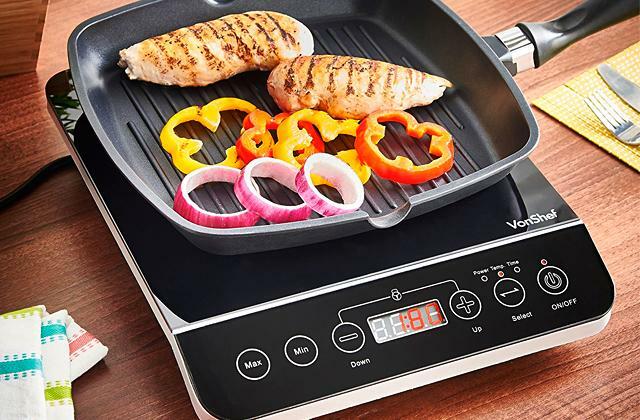 Programmable units stand out for electronic controls, a LED display, and feature a digital timer allowing you to set the desired cooking time. Moreover, the latest models even offer a WiFi connection that will let you set up and control your cooker remotely via your smartphone. Mechanical units are much simpler and usually come fitted with mechanical control dials for temperature mode selection. However, despite the difference in controls, there is not much difference in performance between these two types, and the extra features are added mostly for your convenience. 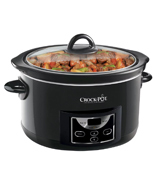 Basically, you will come across round and oval or oblong crock pots. It’s worth saying that the unit shape is not only about personal preferences. Actually, it’s more about dishes you are going to cook in your crockpot. In this concern, a round shape works better for meals cooked from small or cut-out ingredients. These are soups, stews, simmers, sauces, and porridges. Meanwhile, an oval pot is suitable for bigger chunks and all kinds of roasts, be it a whole chicken, ham hock, lamb shoulder, or pork ribs. The pot capacity is one of the most important aspects to take into consideration if you want your crock pot to be useful and meet your needs. Normally, the pot capacity ranges from 1.5 L to 8 L Hence, if you have a small kitchen, seek an appliance for your RV, or simply need a cooker to make a meal for a couple or only for yourself, a 1.5-2 L crockpot will be more than enough. However, for a family of four or five, it’s better to choose a 5-6 L unit to cook several portions of food. On top of that, you can also find truly tiny in size models with a capacity less than 1 L designed for the use on the go. They are mostly used for warming foods up and will become a great addition when eating lunch in the office. All crock pots come with glass lids tightly covering the pot to lock the heat, vapours, and moist inside for better food texture and taste and also to give you an opportunity to watch your progress without removing the lid. For convenient and safe handling of a hot unit, there are cool-touch handles and some lids come complete with locking latches to prevent spills. These features are handy not only for serving freshly cooked dishes but also for taking your crock pot to some socials or on-site events. A Keep Warm function will help you maintain a nicely warm temperature of your food until you serve it. Meanwhile, a non-stick coating on the pot will ensure quick, easy, and no-hassle unit cleaning. In a busy world that we live today, a crock pot or slow cooker might become a real lifestyle changer. If you work a lot and usually have neither time nor desire to cook in the evening, this kitchen appliance will help you improve your nutrition replacing take-outs and fast food by healthier and definitely tastier meals and will let you spend more time on things you would like to do after work, be it meeting with friends, going to the gym, or simply relaxing on the couch. And if you are a mom of several kids with a lot of chores to juggle every day, you will surely appreciate a couple of hours for yourself resting assured that your big family will have a freshly cooked dinner just by the time they will all get back home. Some veggies and legumes can bring more nutritional perks when heated. Thus, boiled or simmered tomatoes release much more lycopene known as a powerful antioxidant protecting your heart and preventing cancer. Similarly, in the cooked corn and spinach, the content of lutein providing protection for your eyes is times higher than in their raw counterparts. No matter how sad it might sound, but grilling and frame-broiling are not the healthiest methods to cook meat. Along with the formation of delicious golden crust on your favourite beef steak or pork tenderloin, due to fat and protein contact with heat, they promote the generation of harmful compounds known as AGEs (advanced glycation end products) increasing the risk of cancer, heart diseases, and diabetes. Meanwhile, slow cooking reduces AGEs production by 50% that will be highly appreciated by all health-conscious meat eaters. Do not keep the cooked meal in the crock pot for long to avoid overcooking. Q: Is crockpot cooking safe? A: Normally, all bacteria are killed at temperatures above 74°C. In a crockpot, the food is gradually heated reaching the simmer temperature of 98 °C and cooked within 3 to 7 hours depending on the selected cooking mode. Such temperature along with a long cooking time safely kills common bacteria, including E coli, botulism, and salmonella. Hence, crockpot cooking is absolutely safe in case you follow the cooking times specified for different recipes. 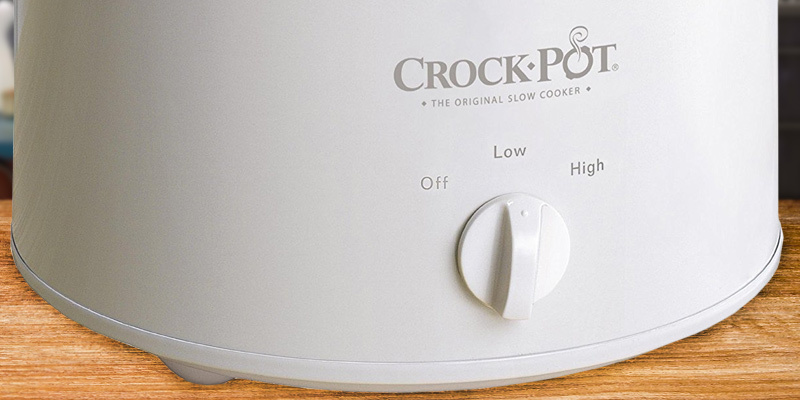 Q: What is the major difference between High and Low crock pot settings? A: Both High and Low modes use the same cooking temperature and the major difference between them is how long it takes to reach the simmer point. Thus, usually, for a Low setting, this time varies from 7 to 8 hours and for a High setting, it varies from 3 to 4 hours. Once the food reaches the simmer temperature (98 °C), the total cooking time will depend on ingredients cut and weight to get that unforgettable flavour and tender texture you expect from slow cooking. Q: Do I need to stir ingredients while cooking in a crockpot? A: For most crock pot recipes, there is no need to stir while cooking since ingredients are evenly heated from all sides and will not stick to the ceramic pot. Besides, opening the lead will decrease the temperature inside the cooker that will increase the cooking time accordingly. Hence, it’s better to refrain from stirring unless your recipe requires stirring. Q: Can I reheat pre-cooked foods in my crock pot? A: Technically, it is possible, Yet, you will hardly be ready to wait for about an hour while the unit will warm up the food. 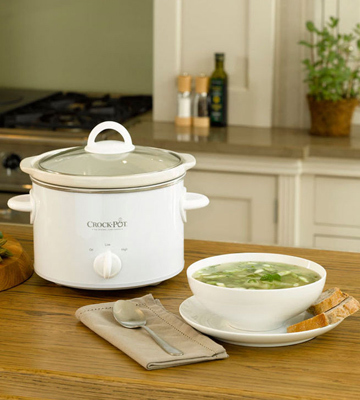 Most crock pot models feature ceramic inserts suitable for the use in ovens and microwaves. So, you can quickly reheat your meal in a microwave. Q: Do I need to pre-brown meat before placing it into a crock pot? A: Basically, you don’t. However, many people prefer to do it to add some deeper flavours to the dish and seal in juices. The only reason it might be helpful is to get rid of excess fat prior to adding meat to the crockpot. Anyway, it’s not the necessity and it’s up to you to decide whether you need an additional cooking step and some more dirty dishware to go with it. Q: Can I slow cook using frozen ingredients? A: Yes, you can and that makes up one more indisputable advantage of crock pots. The only thing you will need to do is adjust cooking time accordingly to let frozen ingredients melt, especially if you cook frozen meat or poultry. On average, it will require additional 4-6 hours on the Low setting and up to 2 hours on High. Yet, you should avoid putting frozen ingredients into a dry pre-heated pot since rapid temperature change might cause cracking. Q: Is it safe to use aluminium foil or baking bags while cooking in a crock pot? A: Absolutely. 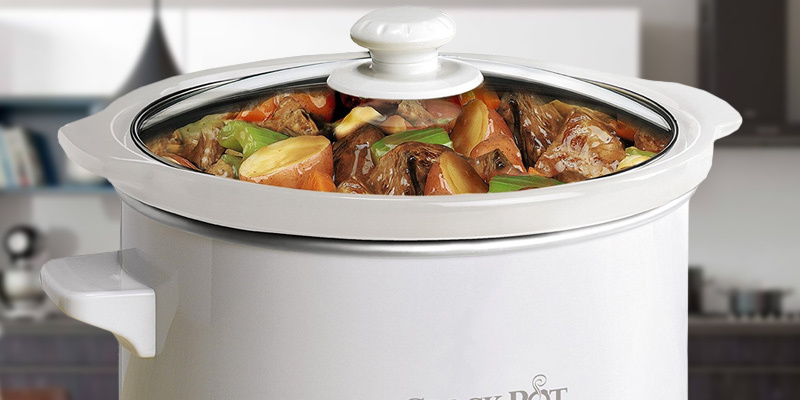 Crock pots allow cooking meat, fish, veggies, and other ingredients wrapped in a foil or sealed in a baking bag. Moreover, when it comes to a baking bag, it is very convenient. Once your dish is cooked, you can simply take it out in a bag and serve, saving your time on cleaning the pot. 1. Slow cooker, Wikipedia. January 31, 2018. 2. 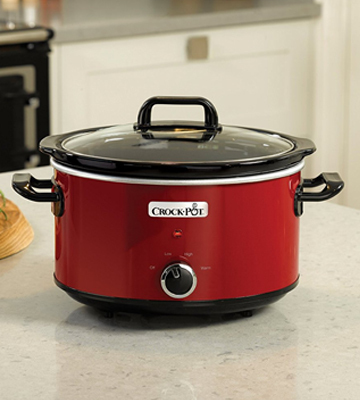 Kelli Foster What's the Difference Between a Crock-Pot and a Slow Cooker? The Kitchn. April 6, 2015. 3. Caroline Hire 10 top tips for using a slow cooker, BBC Good Food. 4. Alison Spiegel A Brief History Of The Crock Pot, The Original Slow Cooker, HuffPost. January 12, 2015. 5. Dori Owczarzak The Benefits of Slow Cooker Meals, PennState Extension. December 13, 2017. 6. Monica Reinagel 5 Healthy Reasons to Dig Out Your Slow Cooker, Quick and Dirty Tips. August 18, 2015. 7. 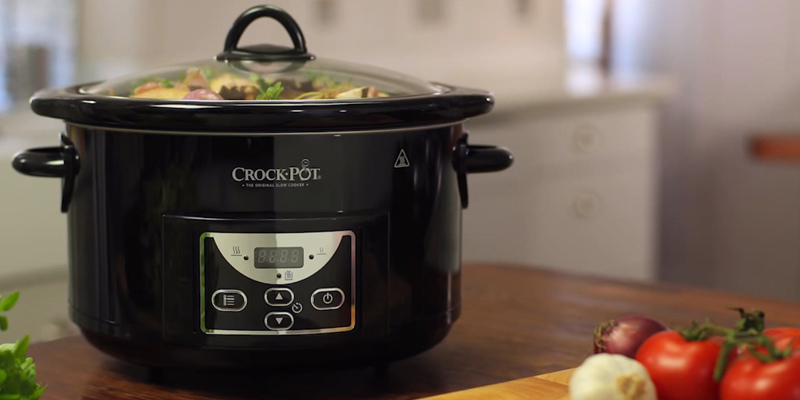 Lynn Andriani 4 Ways Crock-Pots Simplify Your Life, Oprah. March 26, 2015. 8. Crock Pot vs Pressure Cooker – Which Is Better For Everyday Cooking? Food.